Last Winter, Mike and I spent some time in London. It’s one of my favorite cities – full of fun cafes, quirky shopping, a blend of old and new architecture, and of course, food. London is well known for their Indian food scene and even though I’ve been to London four times, the last was the first time I tried out Dishoom, a Irani-style Bombay inspired cafe. They serve a modern take on Indian food and it is absolutely delicious. One of the reasons why it took so long to make it there is the fact that they have notoriously long lines and no reservations. One day though, we decided to just go for it. We spent about an hour waiting outside under some heaters, complimentary hot chai in hand, peering in at diners, dreaming about what we were going to order. In some cases, when you build up a restaurant in your head you end up disappointed. It might be the service, it might be the atmosphere, and sometimes, it’s even the food. Thankfully, that wasn’t the case at Dishoom. It was so nice that Mike and I ended up going twice. We even ended up ordering some of the same dishes, we were that in love. One of them was the black dal. To be honest, I wasn’t initially interested in the dal, even though the menu was trying really hard to sell it. It’s Dishoom’s house special and each batch cooks for over 24 hours. I noticed it, but with so many other delicious things to order, it just didn’t jump out at me. Thankfully the server told us it was a must; she was right. It was deep and dark, the lentils were the perfect falling apart, yet still holding together texture – tiny bursts of flavor that exploded into deliciousness with just a touch of pressure. 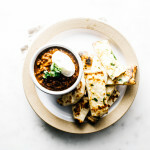 I kept telling Mike, as I used garlicky naan to scoop up bit after bit, I have to figure out how to make this at home. It was easier said than done though. Dishoom’s black dal is their closely guarded secret and intense Google searches revealed nothing. Eventually, I went with a modified version of this recipe, adapting the spices a bit and upping the cooking time infinitely. I know 24 hours is a LOT, but it’s entirely hands off – a covered pot just sits in an extremely low oven – and the result is incredible. This was my first time making dal, but it won’t be my last. Especially since I just went ahead and bought an extra large bag of lentils. This dal is filling, hearty, luxurious, and best of all, full of protein. You could leave out the butter and cream for a vegan version, but I think they add just that extra bit of oomph that I tasted in Dishoom’s version. One last thing: I’m sure you’ve heard by now that 2016 is the International Year of Pulses! Some of my favorites are: chickpeas, lentils (like the ones in this post), dried peas, and beans. When you cook them properly, they have the absolutely best texture. I always have pulses in my pantry (right now I have adzuki beans, chickpeas, split peas, great Northern beans, and mung bean threads), which makes it easy to eat them once a week. I hope you’ll try to as well and take the Pulse Pledge with me! This isn’t a quick recipe, but the hands-off time is completely chill and the end result is absolutely amazing. Slow cooking in the oven adds a bit of smokiness that you wouldn’t otherwise get on the stove. Make sure you use a heavy bottomed cooking vessel with an oven safe lid. I used a petite Staub and the depth worked perfectly. You don’t want too large of a pot because the dal will be too shallow, which could potentially lead to burning/drying out. Soak the lentils in plenty of cold water overnight. The next day, rinse and drain well. Place in a large pot and cover with cold water. Bring to a hard boil for 5-10 minutes, skimming if needed. Reduce the heat and simmer, stirring occasionally, until lentils are very soft but still hold their shape, about 40 minutes to 1 hour. If needed, top the pot up with water. Drain and set aside. In a dry pan, lightly toast the cloves, star anise, coriander, cumin, cayenne, fennel, garam masala, and cardamom, stirring constantly until fragrant, about 30 – 45 seconds. 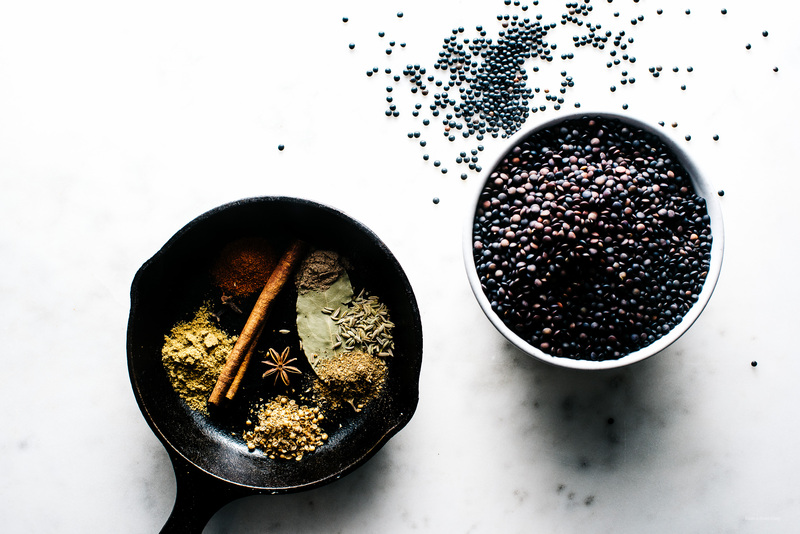 Remove from heat and grind in a spice grinder or crush with a mortar and pestle and set aside. In a oven safe heavy bottom pot, heat the butter and oil over medium heat. Add the onion and cook until soft, 5-8 minutes. Add the ginger and garlic and cook, stirring, for 1-2 minutes. Stir in the spices, cinnamon stick, and bay leaf. Stir in the tomato paste and add up to 1 cup of water to bring the whole thing to a thick, soup-like consistency. Add the lentils back in, adding a bit of water, if needed. Tightly cover with foil or an oven safe lid and cook for 3-4 hours checking every 30 minutes or so, adding water if needed to maintain a soup like texture. 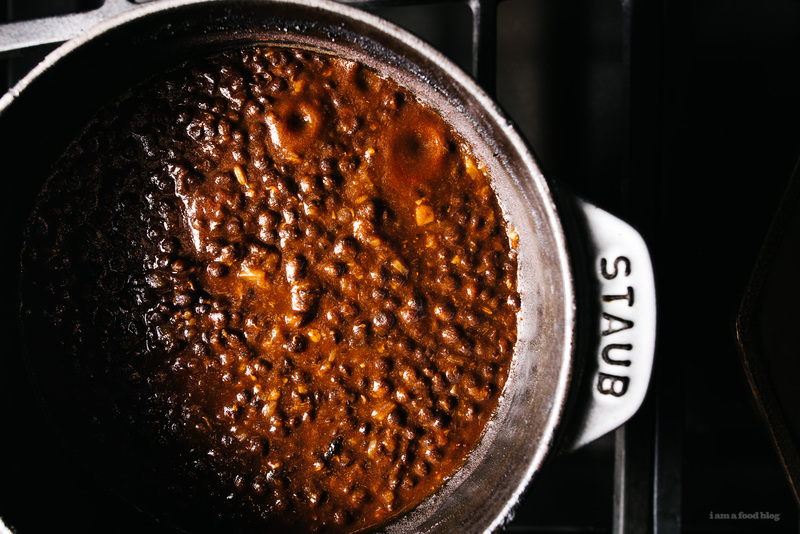 If you’re committed and want to cook your dal for 24 hours, turn the oven to 200°F overnight and then up the temperature to 300°F when you get up in the morning. Give it a good stir and let it cook, at 300°F until you hit 24 hours. Remove from the oven and stir in the cream and butter. Taste and season with salt. Enjoy with rice or naan! In a small bowl, whisk together the milk and yogurt. Set aside. Mix the dry ingredients together in a bowl or on a clean work surface. Make a well and slowly add in the milk-yogurt mix bit by bit, combining with the flour. Knead into a soft dough. Gather into ball and cover 2 hours. Lightly dust your work surface with flour. Divide the dough into 4 equal pieces and use a rolling pin to flatten and stretch out. Heat up a heavy bottomed cast iron skillet (with a lid) over high heat. Brush one side of the naan with water and place in the skillet, water side down. Cover and cook for 30 seconds or until you see it start to bubble and rise. Use a pair of tongs and take it off the pan and cook the uncooked side over direct flames until it starts to char. Alternatively, flip and cook the pan until it starts to brown. Brush with a bit of melted butter and sprinkle on chopped cilantro. Repeat with the remaining 3 pieces. Note: I made the melted garlic butter by heating up about 2 tablespoons of butter and 3 cloves of minced garlic over very low heat until the garlic was cooked through but not brown. This post was sponsored by USA Pulses & Pulse Canada. Thanks for supporting I am a Food Blog! 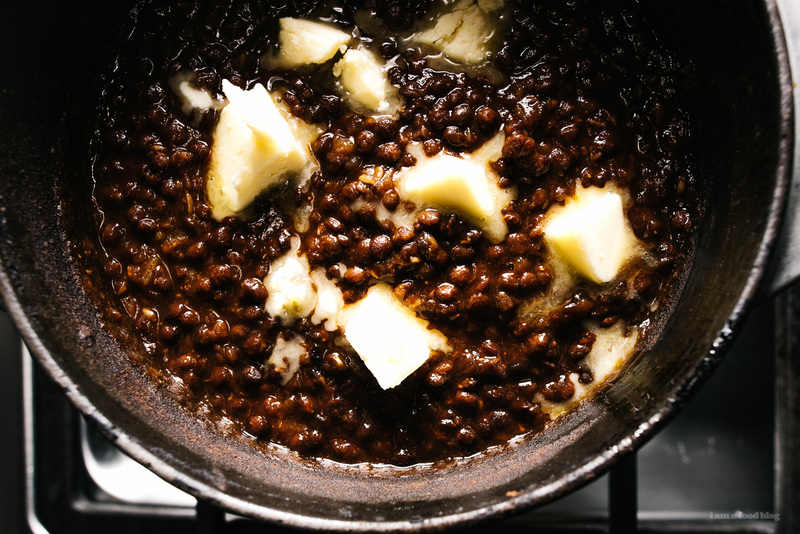 This dal is just…perfection! Love those black lentils!! I LOVE Dishoom! I go every time I’m in London for business. The daal is definitely worth it. I almost skipped it too. Also, they do take reservations, but maybe only for large parties? Also, have you been to their brunch? I never thought I’d be a fan of savory, spicy breakfasts, but I was pleasantly surprised! This looks incredible, I am definitely going to have to give it a try. First love and this looks amazing! I’ve heard so much about Dishoom I only wish I can eat there. Dal is underrated and so delicious! 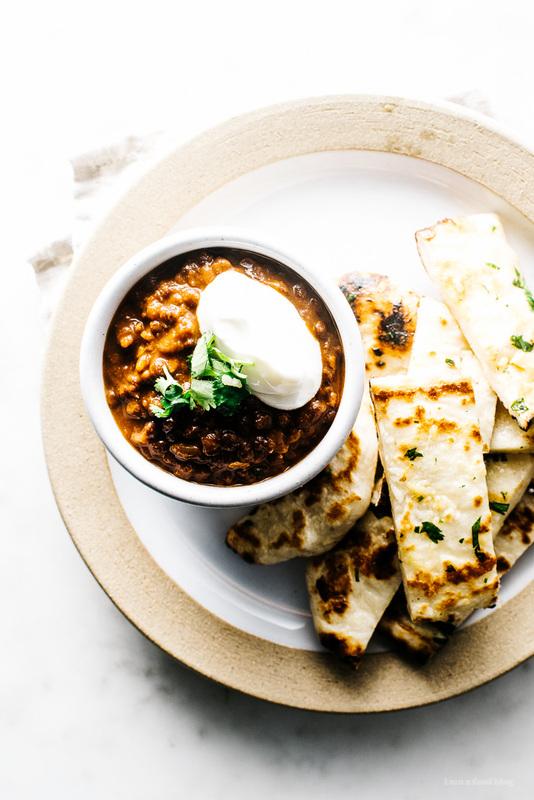 A simple one come together so quickly and makes a great meal with some naan or chapati and yogurt. This sounds absolutely phenomenal. Can’t wait to try it. When do you add garlic in your naan recipe? whoops, i added that! thanks for the heads up! Can the Dal be made in a pressure cooker? There’s no garlic in the garlic naan? i haven’t tried in a pressure cooker – i’m not familiar with how much/little time it would take but imagine it can be done. i added the garlic in – thanks for letting me know! thank you!! i hope you give it a try! Oh my. This looks amazing. Love the video of the naan over the gas – I always feel legit when I warm pita like that. OMG. I just made this for dinner tonight and it was fantastic. So much so that I want to make it again tomorrow. Serious winner right here. They don’t take reservations except for parties larger than 6! Theres always a line out the door, even at the new location at Kings X location which isn’t half as nice as their Soho joint. You can get a reservation at Dishoom for lunch, though. And I think “lunch” goes until 5:30. We ate there between Harry Potter parts 1 and 2. Life-changing!! Particularly for my now-obsessed-with Indian-food 12 year old. Hi- this looks insane! I live in East London and have been to Dishoom quite a few times. That dal… Omnomnom! I see you used black beluga lentils… could I use the same method with black urad lentils? Black beluga lentils are a lot harder to find! To get even more smoke flavour I heat a barbeque charcoal over a flame till it is red hot. Then pop a small bowl with a lump of butter and a few cloves into the finished pot of dal (it should balance nicely on top.) Drop the hot charcoal lump onto the butter and cloves then put a lid onto the dal to catch the smoke. leave for 20 minutes. This method also is good for finishing oven cooked tandoori or tikka chicken. I was looking for a BB Dahl recipe that would help me imitate Dishooms! I can’t wait to make it!! Thank you! I’ve been to Soho & Shoreditch, both were great. I wish I lived closer to london! Made this because I was missing the real thing from dishoom. If all vegetarian food was this good, I might actually be vegetarian :D. Great work! Can this be made with green, brown or red masoor lentils? i haven’t tried it, but i would say, yes, for sure! I can’t wait to try this recipe! I’ve been dreaming about this ever since I got back from London! Thank you for sharing! not silly at all! you add tomato paste and water to the beans, which expand considerably. it depends on if you’re serving it as a side or a main. i think it will serve 5-6 as a side if you have lots of naan, if you need it as a main, i’d double it just to be on the safe side. Made this, great recipe and the overnight cooking makes a LOT of difference, didnt bother with soaking the lentils just cooked them first, also added a little more of the spices for a stronger flavor. My shop only had Green lentils but I’ll go out of my way for black next time as they give it a better flavor. Well done. I am huge fan of your blog, thank you for so many wonderful recipes, some of which I have already made with excellent results. 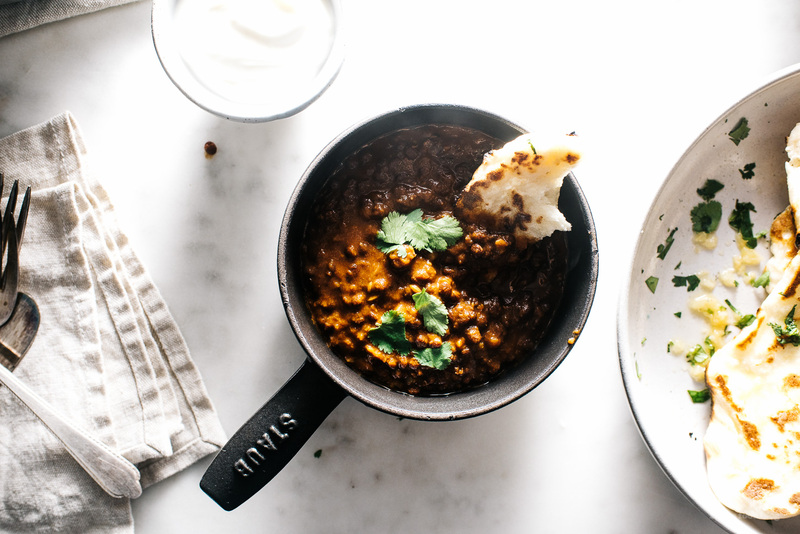 I have a question about this one (I LOVE Dishoom’s black dhal and can’t wait to make this!). Could I used pre-cooked beluga lentils? I couldn’t find dry ones and am wondering if the extended cooking time of this dish will turn pre-cooked lentils into a mush. Thanks in advance. i haven’t tried with precooked lentils, but i think it might work. but you’ll definitely have a different texture. you could definitely do the recipe with other lentils if you can’t find black ones. hope that helps a bit! Excited to try this! Do you think this could this be done using a slow cooker on low heat? i suspect that it would work well, but i haven’t tried it. if you do and it works out, please let me know! also, keep an eye on the liquid content. you don’t want it too be too liquid-y but you don’t want it to dry out either. hope that helps a little bit! Wow, so excited to come across recipe. 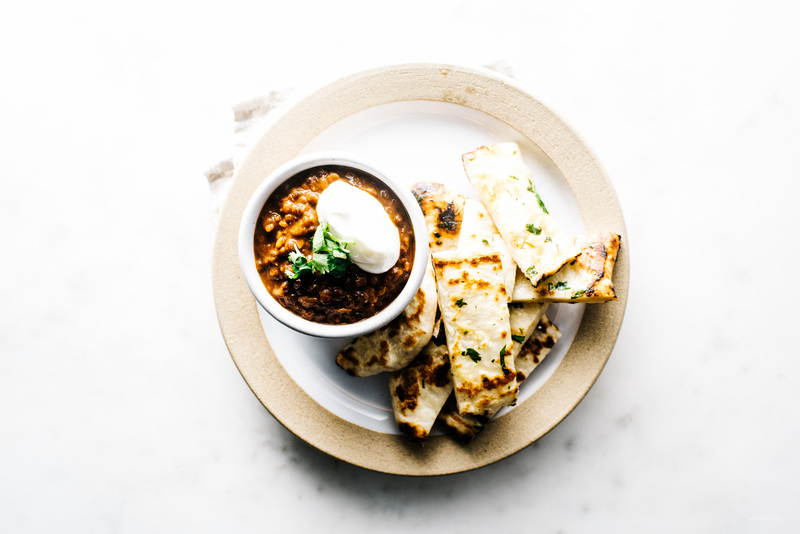 Had the amazing dish at Dishoom the other week and it’s so delicious – can’t get enough! Had to order my organic beluga black lentils online – pricy, but hope it’s worth it. I will try to cook mine in the halogen oven and see how it turns out. Thanks for the recipe! Sorry I’ll try again 🙃 I love Dishoom & their Black Dahl can’t wait to try this recipe. Bit confused about timing for cooking 24 hours please can you clarify. after completing the steps on the stove (toasting the spices, bringing everything to a soup like consistency), cover the pot tightly with foil and then bake for 3-4 hours at 325°F, making sure to stir every so often. then, turn the oven down to 200°F and cook overnight – technically it’s not 24 hours, if that helps! This is so delicious. I used a slow cooker- on high at first and then low overnight. It was so good that I regretted not making a double portion. Hey, thanks so much for this recipe. Can’t wait to try it. I am in the UK and wanted to check what you mean by Tomato Paste – is that the same as Tomato puree? Thanks. Can you make this in a slow cooker overnight instead of using the oven? i haven’t tried it, but it think it would work, just make sure to check before you head to bed to see if it’s too dry and add a bit of liquid. let me know how it goes! Very good. I did 3hrs with 180°C in the oven, then turned up to 230°C for 15 min, then switched it off an let it sit in the oven over night. It reheats very well too, even tastier. Since my wife first visited Dishoom in Soho in 2015, and then again in 2016, I have been told repeatedly that it is FANTASTIC, and especially the Black Dhal!! In case you didn’t know there is now a Dishoom on St Andrew’s Square in Edinburgh, only 20 miles from home, and I agree…….it’s amazing! I now make your recipe by the half kilo (dry weight) to be frozen in batches, in case of urgent need! After all 20 miles might be too far in times of urgent need!!!!!! Thank you for the time that you have spent constructing this recipe. After letting it cook overnight at 200, then in am, stir it and put it back up to 300 ( for the rest of the 24 hours,) should I continue to add a bit of water to it (if needed) and check it every 1/2 hour? Is there a big difference in taste if I don’t cook it at 300 for the last 9 hours, but instead just let it cook overnight? you can definitely let it just cook overnight without finishing it at 300, but i find that the last bit thickens up the dal and reduces the liquid! what you mean by whole cloves? is it garlic clove? I loved this dish myself and desperately want to cook it! I’m terrified of the idea of leaving the oven overnight though. Isn’t this very very unsafe?! hi! it’s a really low temperature so you should be fine! Just checking….are the cardamoms in the recipe the normal green ones, or did you use black ones to give a smoky flavour? Followed the recipe exactly – even slow-cooked it for 8+ hours on 200 after 3 hours at 325. It is half-decent at best and nothing like Dishoom’s. Any thoughts why this might be Chris? Any flavours in the Dishoom version not in this do you reckon? I made this at the weekend as part of an Indian feast for friends, and it was an absolute winner! 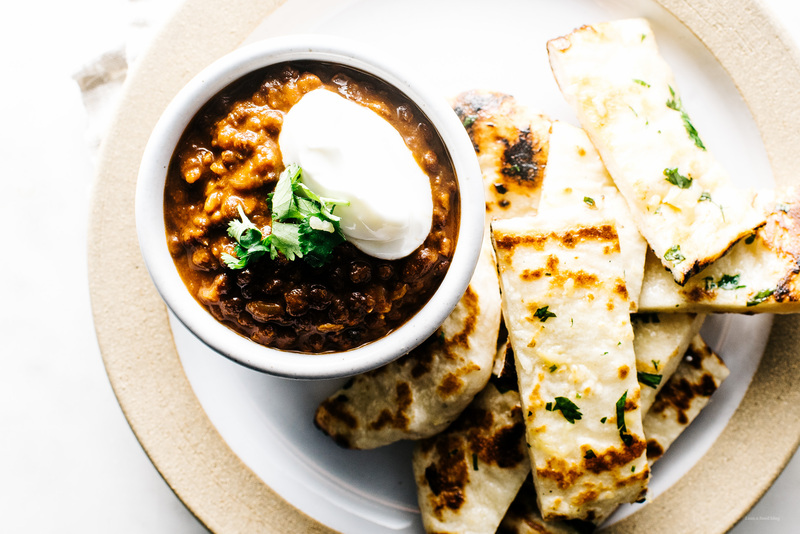 I used a slow cooker (3 hours on high, the remaining 21 hours on low) and it was sensational – even converted those less keen on dal as despite the long cooking time the lentils still kept their bite. I’ll definitely be making this again! Thank you very very much and have a lovely day! 1. it should be okay if you don’t soak the lentils. hope that helps! please let me know how it turns out! Hi, I went to the Edinburgh Dishhoom last year and fell in love with the masala beans at breakfast! I wondered if anyone had a decent recipe for this. It should be really simple, but although I have tried to recreate it I can’t. Any tips would be appreciated. I haven’t been able to find any black lentils at all (neither beluga nor black urad), I found mungo beans and brown lentils. Do you think either could work? Which one could taste more close to Dishoom’s? I’ve been craving their black urad since last year, and I’m quite far away to go! i would go for the brown lentils!